When your Q’s and NME’s print essential guides to this year’s festivals, Bearded Theory barely gets a look in and, to be honest, long may that continue. This is a sell out festival that attracts the right kind of people. It doesn’t need thrill seeking gatecrashers to spoil the vibe here at Caton Hall in Derbyshire… It’s our festival… There’s no sponsorship or branding… Just great music, entertainment and reasonable prices. From its origins as a friends birthday party in 2007, Bearded Theory has outgrown its capacity several times and has had move to move sites. It is a family festival and the teenagers you see here in abundance were the 5-year-olds that were toddling around with their parents over the last decade and have been coming back every year. Genres this year was leaning heavily on Ska with Madness closing the Sunday night and the bulk of crusty convoy acts being ska-punk. There was enough to keep the broad and open minded occupied with indie, dance, punk, reggae, dub and folk on tap over the weekend. This is my third Bearded Theory; deciding Downloads, Readings, Isle Of Wights and Vs had become too expensive, over subscribed or just plain shite. The last three years have seen Thursday night grow from being 3 Daft Monkeys in a tent too small to accommodate everyone, to Dub Pistols in a marquee too small last year, to Dreadzone filling the main stage (The Pallet Stage) this year. As a result, Thursday has become almost a proper festival day rather than just party night. Yes it is party night and yes, as early birds we partied just a little too hard. Andy Fatman, my sisters, Frank Ewe, Mike and myself perhaps peaked a little too soon as punters poured in with their tents, rucksacks and trolleys. We can take our own drinks into the various arenas and stages but are asked not to be silly insomuch that we should also support the bars. These bars are selling Thornbridge brewery produce at pub prices. Cider is on tap on this baking hot day and Dreadzone are on stage, this a perfect combination. The velvet voice of Earl 16 is a notable absentee as he’s on tour with Leftfield, but the vibe is good. 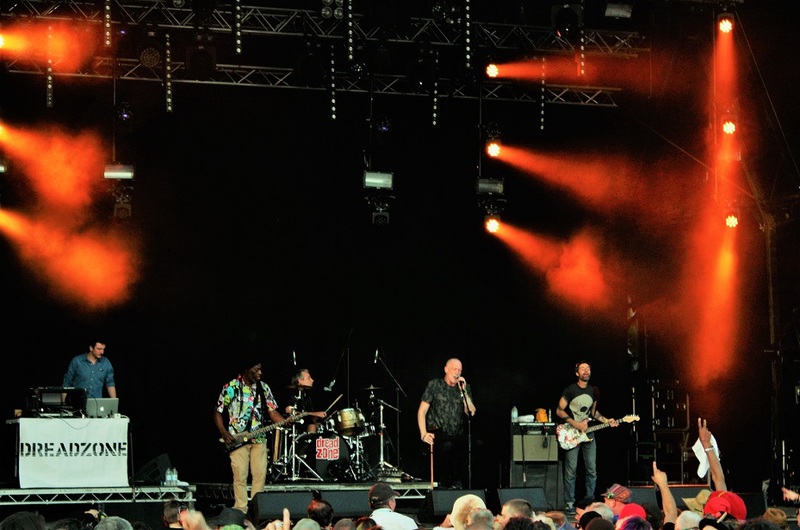 Dreadzone play a festival set, but also include material from their excellent new Top 40 album ‘Dread Times’. There’s something for everyone; nothing too wide of the mark, people are bouncing up and down; these are a good moments.